Did you know that we can only see about 10% of the matter (luminous matter) that exists in our world? That means that the other 90% of what is out there is invisible to us (dark matter). Did you also know that our eyes really aren't “seeing” ? Of course are eyes are seeing but it isn't that simple. Our brain is decoding the information sent to it by the eyes and in some instances it is making up what it thinks it sees based upon prior information and expectations or assumptions. In other words there is a lot of interpreting going on. It is not always a direct translation of what you are looking at. Sometimes there is an incomplete picture being transmitted and our brain must fill in the blanks. Our brain decides what we are seeing. It is estimated that the brain makes up or creates 30-40% of the information that it uses to fill in the blanks. Another interesting insight is that our brain is not actually analyzing the picture it receives from the eyes. It is analyzing the light it is receiving. This is called the Visible Spectrum and it is the only band of electromagnetic spectrum (light) visible to the human eye. The only colors we can see are the 7 colors of the rainbow and each has its own frequency, ranging from 390 nanometers to 700 nm. This Visible Spectrum falls in between ultraviolet and infrared. Some animals such as bees can see infra-red. So our mind is detecting and analyzing the electromagnetic radiation frequencies of the colors it is seeing. This information is transmitted through the eye into the retina where the chemical rhodopsin converts it into electrical impulses. These impulses are then analyzed and interpreted by the brain. The reason I am explaining this is because in all this translation and interpretation our brains can sometimes get it wrong. What you think you are seeing may not be exactly what is there. In fact research has shown that a person may see things differently depending upon their state of mind and their emotional support network. Dr. Kent D. Harber, associate professor of psychology at Rutgers University at Newark has a theory he calls ‘The Resources and Perception Model (RPM)”. “People who have fewer social resources, such as friends and family, literally see challenging objects and events in a more exaggerated way than do people who feel emotionally supported." Knowing this, can you look back and see times when your outlook might have been affected by your situation? Maybe when you were going through a rough patch…..? I know I can relate to this phenomenon. During certain periods of my life when I was going through emotional or personal challenges I think I saw and felt the effects of this. To see if this negative viewpoint was real or imagined I used to check on myself by thinking of something I really loved, something that was a constant thing I always responded positively to. If IT felt bad then I knew the feelings I was having had to be temporary, they weren't real. So I would let it go and not buy into it. 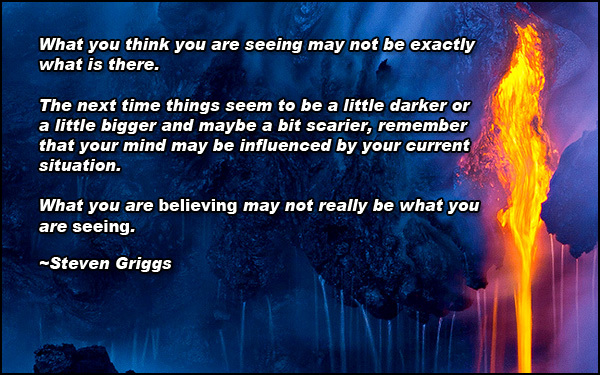 The next time things seem to be a little darker or a little bigger and maybe a bit scarier, remember that your mind may be influenced by your current situation. What you are believing may not really be what you are seeing.